One more GP practice puzzle. Rules Place a number in each cell. 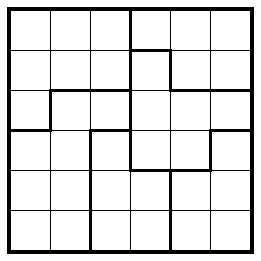 The numbers within an area go from 1 to the size of that area, with consecutive numbers horizontally or vertically adjacent. Cells with equal numbers (necessarily from different areas) must not touch, not even diagonally. This entry was posted in Puzzles and tagged count numbers, easy, meandering numbers, practice on 2014-03-26 by rob.